if you find yourself scrambling to find school supplies, but lack the funds to buy them, know that there are resources to find free back to school supplies. They aren’t always easy to find, and of course, this highly depends on location, but there are a few easy ways to find places that offer free back to school supplies, and luckily, most of them are operated by truly great people looking to help families and students in need! The first step would be to search places like Salvation Army. From time to time, depending on location and supplies, they do provide free back to school supplies to children before the school year starts. Supplies can be limited though, so you’ll want to keep a close eye on your local Salvation Army to see if they offer that, or if they’ll at least be offering sales of some sort. Just keep in mind that supplies are limited and you’ll have to get there quick in order to get some! Another option you have to finding free back to school supplies is searching the internet for local programs near you that offer this. 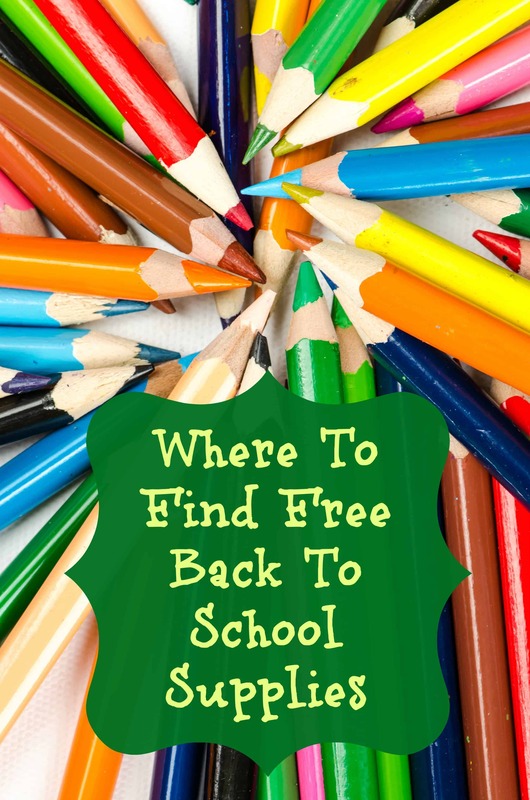 Resources for free back to school supplies can be a little scarce, but the internet is typically a great way to find any and every resource there is! Just a quick Google search of “free back to school supplies” should find you some local programs that offer that service and possibly information about becoming involved as a volunteer. Volunteering for these types of programs is a great way to give back in trade for the free back to school supplies you receive. Lastly, if you’re struggling to find resources, but really desperate to find free back to school supplies and have a love for your helping your community as well, you can start a donation program yourself for your kids and other kids like them who are in need! Many people are really eager to give to children in need especially for things involving education, knowing that children are our future. You can start a fundraising page online, spread the word with flyers, and even get a group together of “board members” who are in charge of organizing a day to fill backpacks, distribute them, or even partner with schools to find kids in need of free back to school supplies who could benefit from a program like that! Ultimately, if you’re in need of free back to school supplies, you have to really look for programs that offer it, or help the community by being the first one to pioneer a program that does! If you have a hard time finding free supplies, check our resources for finding cheap back to school supplies. While they’re not free, they will help you save a lot of money. Do you know of any additional resources for free back to school supplies? Share them in the comments below! My friends and I were just talking recently about how expensive school supplies have gotten. True, I did just buy a notebook for .17 at Walmart, but it used to be that you could get a three-pack of notebooks of .25. Kinda makes me glad I don’t have kids right now, but my college starts back up in two months and I’ll be needing a few things myself. *sigh* It’s good that there are programs out there to help families who are struggling be able to set their kids up for success. I always find my school supplies shopping the sales. Although they are free, I normally can get a lot for less. And I find that stocking up when the school supplies go on clearance helps as well. I have always found a way to stockpile supplies after one of the sales. I am so not ready for summer to be over, let alone shop for school supplies. Its always a nightmare trying to find all these weird things the teachers ask for. I try to stick to one store and that is Target for my needs LOL! Thank you for highlighting obtaining free back to school supplies! I would never have thought to look via the Salvation Army as thought they were all about sharing clothes and food! I will be sharing this with friends who might be also able to learn something today! I do not have kids yet, but these tips that you are offering are great. I know for sure that there are a lot of organizations that do offer and support families with low income and children in need, you just need to inform yourself. I remember that our city hall collaborated with a few local organizations and organized a big “Back to school” event where over 5.000 families in need were helped with school supplies and food. Great post. You often don’t stop and think that not every family can afford to buy school supplies. I would have never thought about the Salvation Army as a resource for back to school supplies. I love being able to stock up on office supplies this time of year. I have a bit of an obsession with office supplies so being able to stock up for less is always aa plus. These are great resources for this time of year. A lot of churches also offer a free Back to School event. A couple near me give away free backpacks, they have professionals available to clean teeth, give haircuts, and perform school physicals. You have shared so many great places to look. I wish the public schools would understand that not all students have money for supplies, some of those Back to School lists are insanely long. I used to teach for a private school and we tried to keep the list pretty streamlined. This is a great post because there are those you can’t afford back to school supplies for their children. There are programs out there that do help those with this every year. Here we have two that I know of which help so many people with supplying book bags, pencils, notebooks, etc. so the kids have them on the first day. Thanks for sharing. Smart idea to start a donation center. I think it’s great you’ve put this post out there! Free back to school supplies!? Yes, please! Local programs are freecycle groups are always a great way to get great items for free, or at least on the cheap. Thank you for letting me know about the Salvation Army’s free school supplies. Learned something new today. Like you, I am always on the look out for discounts for children’s needs. It is always a good thing to be frugal. Wow, I had no idea that Salvation Army had programs to provide children with free school supplies. What a great thing to hear about! I’m sure that could make a huge difference for families who are living paycheck to paycheck. Thank you for sharing these resources, I hope this information is found by families who could benefit from them. Moms like me would love to save on school supplies and if we could get them for free, all the better. Thanks for sharing this. This is a great post because those supplies can definitely be quite expensive. The 99 cents store definitely has some great deals though. Wish they had all these options when I was younger. Great list of resources to help children in need! I feel that children no matter what their social class should be entitled to the same education as well as supplies. There needs to be more programs such as these. I know this area offers free school supplies for kids in need. I think that it is wonderful. It is a huge deal to a child to go to school with fresh supplies. I always pick up extra when I’m able so that I can see a few things to the teachers to help pay it forward to a child in need. This is a great resource. It will sure help a lot of parents. School starts here in just three weeks and I’m anxiously waiting the back to school supply list to be mailed out. Thankfully we should be able to get what we need without assistance. I also know sometimes they have back to school drive bins at local walmarts and you can purchase extra supplies for those in need and put them right there in the bins before you walk out. Thanks for the heads up about these programs! I will be looking out for these programs and seeing if they take donations, as I always have extras.